BikeCommuters.com > advocacy > Friday Musings: What Got You Pedaling? – the cost of parking at my then-new employer. – a desire to be environmentally conscious along with guilt over the shared blood on our hands from multiple oil wars. Incoming freshmen weren’t allowed to have cars on campus when I got my undergraduate degree, so a bike was a no-brainer to get around. When I moved off campus, it was far easier to keep riding than to hunt for a parking space. Once I’d been doing it for a while, the advantages of using a bike were many: free parking (in a crowded downtown business district), convenience, health benefits, pure unadulterated JOY, direct connection to my neighborhoods/community, ease of taking alternate routes to enjoy the sights and sounds along the way, other economic benefits (no gas=more cash in my pocket…booya!). @ghost and dygitul – I hear both y’all! My first commuter bike was an old high school hand-me-down. Having a free bike makes it a no-brainer. That plus the high price of parking on campus meant I was along for the ride with my other two bike-riding roomies! Sleeping in later to bike and park IN my building or in my classroom was way faster than hoofin’ it from the parking structure, almost as far as my house from campus! gas prices and at 46 years old, wanting to get back into shape. Today I have a 26 mile commute, and so far this year I have put on 127 miles that I would otherwise be putting on my Suburban. @john – Mad PROPS: 26 mile commute, that is so awesome! I teach environmental science and the hypocrisy of educating children about the environmental impacts of oil and obesity (I’ll never be a “small” guy) finally got to me and I decided to put my money where my mouth was. I was unprepared for how FUN bicycle commuting is and frankly, that has kept me in the saddle more than anything else. I’m on a bit of a mission to share the good word with my fellow teachers, but it is true that teachers make the worst students, so who knows if I’ll get any converts? @Graham — stressing the fact that it is FUN (over all the other benefits) seems to be the key in winning hearts and minds. I think that if those folks “on the fence” knew just what a blast it could be, it would sway them to give it a try! Bad traffic. My 24 mile commute to work had grown from 45 min to an hour and sometimes took 90 min. I dreamed of biking to work, but always thought it was too far. One day, after getting stuck in some particularly bad traffic, I poked around on google maps to dream about biking to work and vent my frustrations. Well, they have that handy “bike” button, and what do you know…there’s a greenway path that I can use for half of my commute. So, I poked around on freecycle and picked up an old beat-up, too-big-for-me road bike, fixed it up and started experimenting with commuting by bike. I drove half and biked half at first. I kept increasing my number of days biking. I slowly added gear, and eventually got a new bike. Now I bike in every day, and I always smile when biking past the long lines of traffic that I used to get stuck in. I started biking to work when my car broke down. It was a 7 mile commute and I didn’t have the money (or desire) to take the car to a shop. Eventually, I got it repaired, but since then, I’ve been more inclined to pedal to work. For me, it’s the basic economics, freedom, and exercise that keeps me on 2 (human powered) wheels. I got into it mostly for the fun, but also for the exercise. The short version of my commute is about 7.5 miles each direction, but I can easily stretch it to 30, and it’s almost all on either calm residential streets or busy thoroughfares with bike lanes. This makes it easy to make my commute a serious training ride, which is very handy for triathlon training. Believe me, after logging 25 miles on a loaded-down Surly CrossCheck while trying to keep the pace around 20mph, a 25 mile time trial seems almost easy. Anyway, I’d still commute by bike even if I gave up racing, just because I enjoy it so much. The hard part is to convince my co-workers that bike commuting is not inherently dangerous. Tampa has an extraordinarily high cyclist fatality rate, so you really have to plan your route carefully and stay aware as you ride. But if you take adequate precautions, it’s a really great way to get back and forth from the job. B. The Bicycle In a class by itself, this vehicle offers the best of both worlds. The common bicycle is fast, quiet, muscle-powered, and easy to maintain. Add to this the additional advantage that it is the only vehicle you can pick up and carry if the terrain gets too rough. People using bicycles to escape from infested areas have almost always fared better than those on foot. For optimum performance, use a mountain bike, as opposed to the racing or recreational model. Don’t let your speed and mobility go to your head, however. Wear standard safety gear, and choose caution over speed. The last thing you want is to end up in a ditch, legs broken, bike trashed, with the shuffling of undead feet growing louder with each step. …and to save on gas, of course. Circling the parking garage in a line of cars, and then shuffling from the parking garage, down one elevator, across a street, and up another elevator with a mass of people who weren’t quite awake felt a little too Orwellian, so I started experimenting with other ways to get to work. I ended up on a bike! CAl PoLY!!!! Pay for parking pass = lame/ you had to car stalk people to get a parking spot out by the Ag fields anyway1!!!! And I LUF my bike!!!! 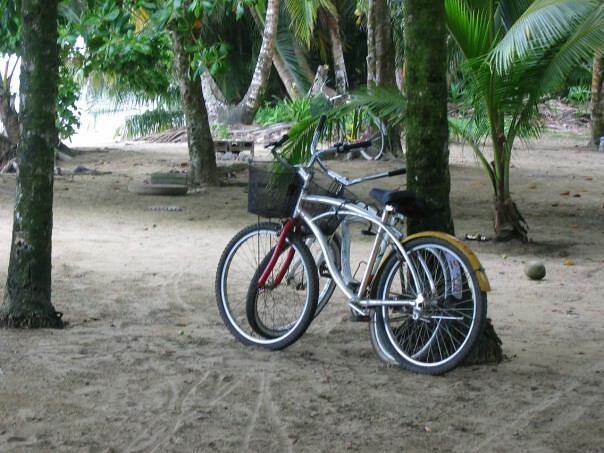 And I had a banana seat yellow bicycle when I was a kid…what better way to get started! 1973 – The Arab Oil Embargo; gas at $0.50 a gallon! Argh! Bought a 10-speed Schwinn Varsity and commuted to work until I got laid off. 2002 – Son wanted to get the Boy Scout Cycling merit badge. Bought mountain bikes. Let them sit after that. 2008 – Gas at over $4.00 a gallon! Argh! Brought out the mountain bike, started back bike commuting to work. 2008 to Present – Dang! Pedaling to work is just so much FUN! Oh … and, RL? You got FINE legs! I started biking to lose weight, save gas, and get used to being on the saddle. I remember the second day I started biking, I almost rode the whole way to work standing because I couldn’t sit down! But now, I actually look forward to getting on my bike to get to work, feels like I was productive (more so than when I’m at work). Pure economics got me bike commuting back in 2008: the high cost of gas and auto maintenance, along with the cost of living in the southwest and reduced income when I had to accept a job outside my field when we relocated for my husband’s job. We could rob Peter to pay Paul every month or we could sell a car and live more frugily. It certainly helped that Copenhagen Cycle Chic give me fashion inspiration and blogs like Bike Commuters and Paul Dorn’s site gave me practical tips on how to get off to a successful start. It also helped that we have pretty good bike infrastructure here and low humidity so I never arrive at work covered in sweat. Freedom. I started biking before I was old enough to drive. Rather then constantly begging rides off of people, I found I could get most places with my own, two legs, and I loved the independence that gave me. Eventually I decided I “needed” a car. But once I had grown to rely on it, the sense of independence was gone. A red light on the dashboard could herald the draining of my bank account. A strange sound could leave me wondering how long I would even be able to get to my job. I finally grew tired of the constant apprehension that comes from knowing that your whole life could fall apart if the wrong part of your car failed. I started working my bike back into my life, and got that sense of freedom back. Now my car was my back up transportation. And when it did break, I knew I could fix it at my leisure. And when it sat broken for almost a year because I just didn’t need it enough to deal with the hassle of repairing it, I sent it away (to a farm, in the country, where it can roam free at whatever speed its tired, old clutch will allow). Not using my car was nice, but not having to worry about it at all was even better. But I agree with those who have commented before me: My independence from my car, health benefits, environmental benefits, etc. wouldn’t amount to nearly as much if it wasn’t also the most fun way to get around. Who finds a more circuitous way home just so there commute can last longer? Bike commuters do. That should be reason enough. A beat up 1989 Honda Civic that wasn’t going to last much longer and a desire to get outside a little more. That was September of 2000, and a Trek 4500 did the trick. By the time I dumped the Civic for a Tacoma 5 months later, I was hooked and the Tacoma didn’t move much. I dumped the Tacoma in 2007 and now my wife and I share a car and I ride 90% of the time. I saw “Breaking Away” when I was a kid, and had dreams of being Dave and riding a Gios. Unfortunately, I ended up being Mike and riding a Raleigh touring bike as a teenager. No racing scene in south Louisiana at the time, and since my bike was my only means of transport, I was always a utility cyclist. I was stationed in Wyoming when I was in the Air Force, and it was at the beginning of the MTB craze, so I bought a mountain bike and rode that all over Cheyenne. When I got out, I quit riding for a few years, but decided to add it to my routine once I started lifting weights. When I was in my early thirties, I started bike commuting, but didn’t get really into it until my car died. Now I do S24O rides and use my bike for as many errands as possible. Gas is expensive. sounds like riding a bike to get around goes hand in hand with the DOWN economy! Keeping more cash in your wallet and more fresh air in your lungs! I too, ditched my car after a year and a half of bike commuting in Seattle when I moved to Cap Hill. The parking was SO BAD, I had to leave it with a friend who had a driveway in a different neighborhood. I eventually sold the car to my friend and saved myself the parking tickets! The car was just starting to get warmed up when I arrived at work. It’s just too close not too ride. Saving on the wear and tear of running the car, approximately 4 miles round trip, is a much bigger savings than on the fuel. I was inspired by a coworker, he made it look like so much fun that I eventually caved and gave it a whirl. I only live a mile and half from work and I was paying $72-$140 a month to park. It was completely ridiculous that I was driving but biking didn’t even occur to me because I hadn’t been on a bike since I was 12. I really REALLY wish I’d “discovered” bike commuting much earlier in my life. Over the past 10 years I’ve never been more than 5-6 miles from my job. Ugh, it makes me want to cry thinking about all those awesome rides I could have taken instead of being stuck in a car or standing on a bus.